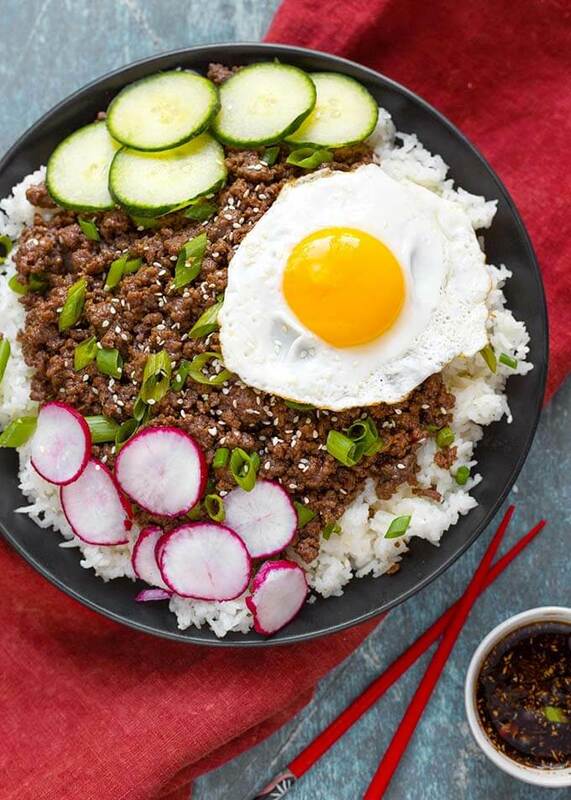 Instant Pot Korean Ground Beef is not only fast, but it’s versatile, and so delicious, made with ingredients you may already have! Cook your rice right along with this pressure cooker Korean Beef for a flavorful one-pot meal! One of my most popular Instant Pot ground beef recipes. 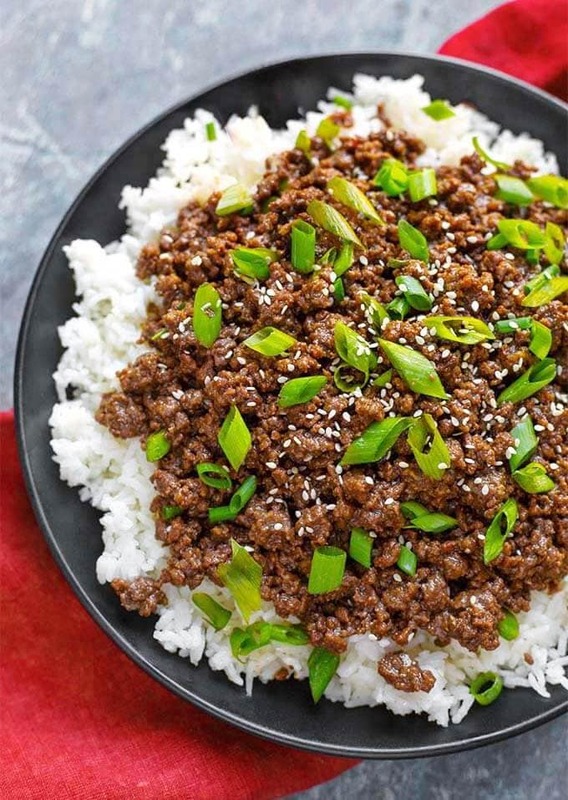 When you get bored with what you have been making for dinner, and want something different to make with that ground beef you have, Instant Pot Korean Ground Beef is a great meal to make. Do you want tacos? Make Asian tacos and wow the family! Want a rice bowl? The rice cooks at the same time as the beef, so there’s your one-pot-meal! I love a fast and easy recipe that can be made into different tasty dishes. Any time you can cook more than one thing at a time in your pressure cooker, you save time. I like to cook potatoes with my meatloaf and with chicken thighs. 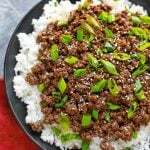 I cook rice with Mississippi Chicken, and rice with this Instant Pot Korean Ground Beef! For this recipe I choose to use Jasmine rice as it has a faster cook time and works well with this fast cooking recipe. You can experiment with different varieties of rice, if you want, and see what works best for your taste. 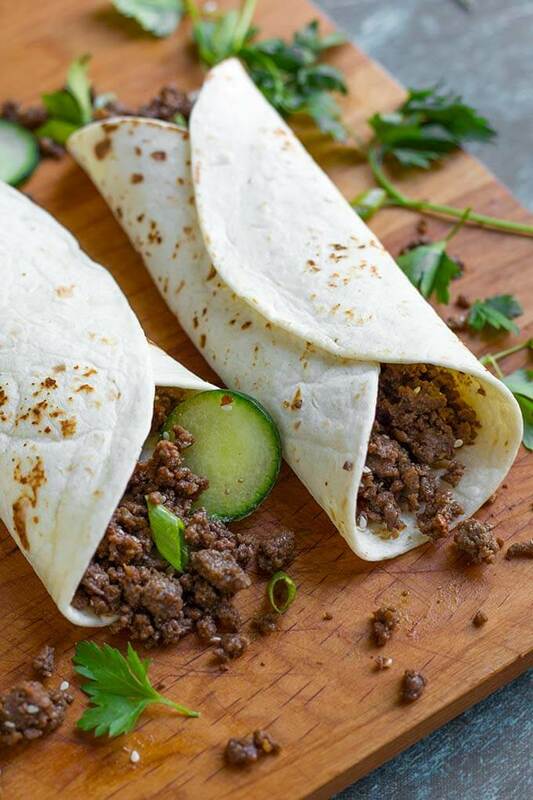 Pressure Cooker Korean Ground Beef makes awesome tacos! Use flour tortillas and add a little rice and some of the beef mixture. A few veggies, cilantro, and some sour cream mixed with a little Gochujang (Korean hot pepper paste) will take this up a notch! 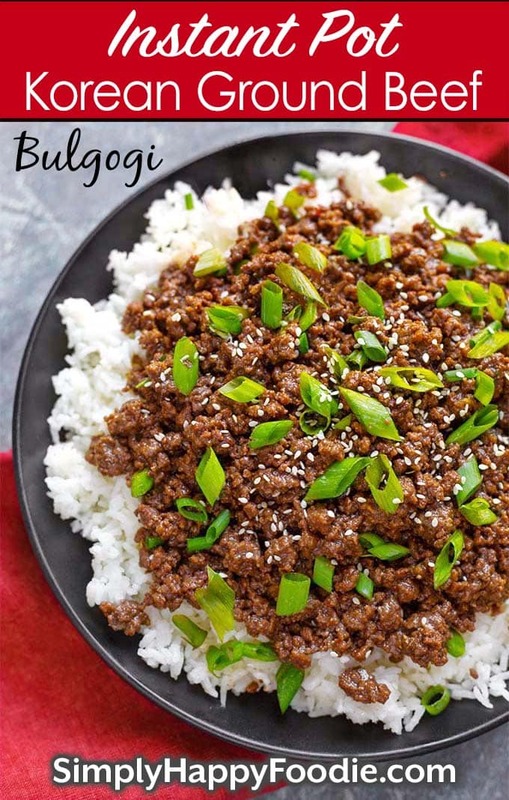 Typical Bulgogi is made with thinly sliced beef that you cook on a very hot grill, but ground beef is a fun shortcut, and it makes for an easy meal. The other ingredient that sounds strange is an Asian Pear. Some call it an Apple Pear, or Nashi in Japan. We started getting these in Washington in the late 1970’s, in my neck of the woods. We love them. They are very crisp, yet not as dense as an apple. They have lots of juice. Grate half of an Asian Pear into your sauce if you want to lean a little closer to the authentic Bulgogi. I didn’t use one for this recipe, but I wanted you to know that it’s really good with the Asian Pear. That’s it! Cooking the rice with the beef makes it so easy! This pressure cooker Korean ground beef is ready to enjoy! Maybe you want something lower carb, but still full of flavor. 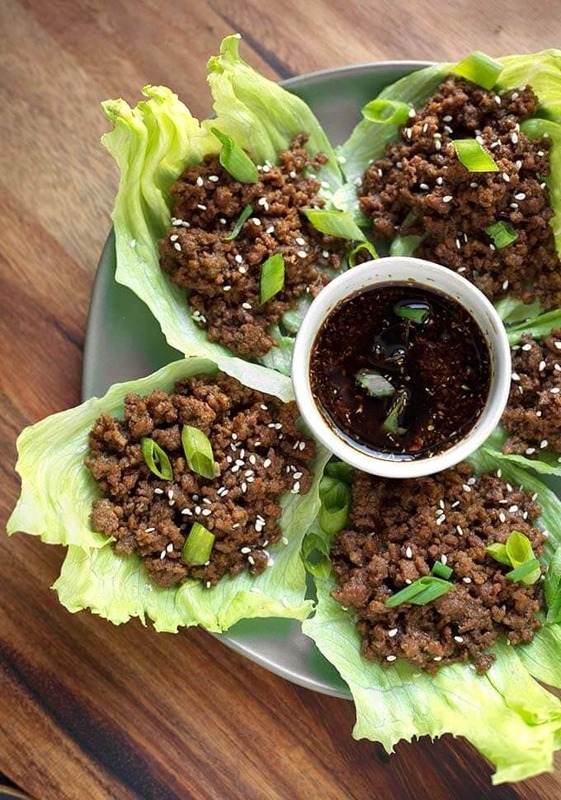 Try making this Korean Ground Beef into lettuce wraps. Satisfying and so tasty! You can probably tell I’m a big fan of Instant Pot Korean Ground Beef. You can also make a Korean Rice Bowl. Add some veggies like radishes and cucumbers, for some crunch. Top with a soft fried egg for some creamy richness. 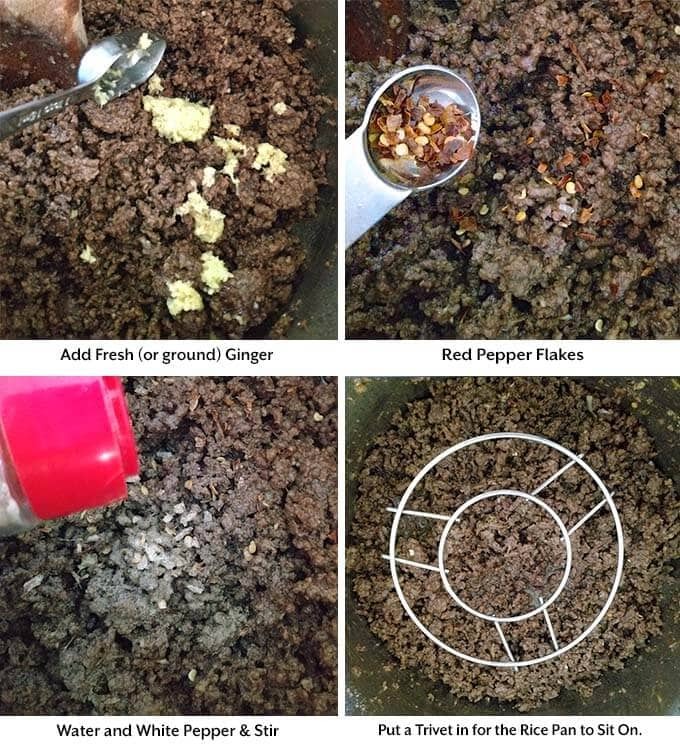 Instant Pot Korean Ground Beef has incredible flavor! 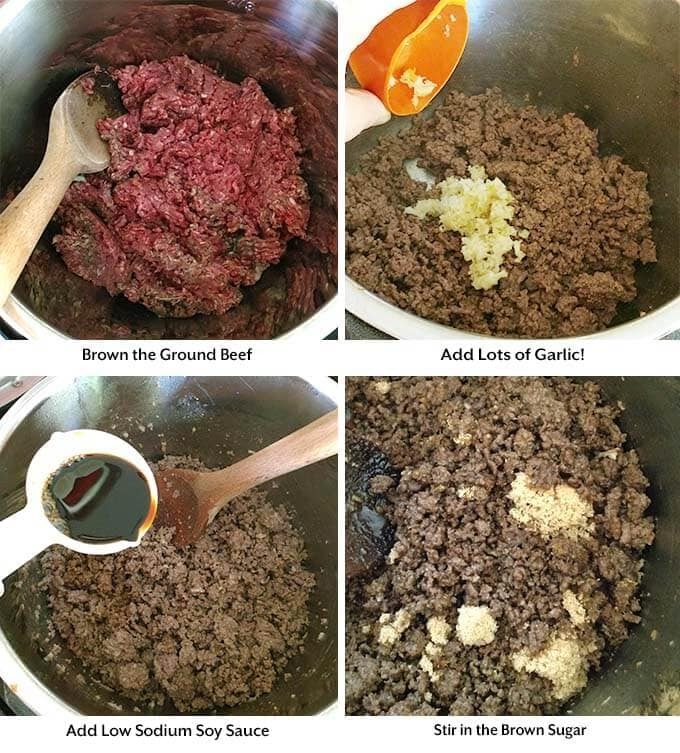 Use this amazing meat for Korean beef tacos, Korean beef rice bowl, or Korean ground beef lettuce wraps. This pressure cooker Korean ground beef is delicious, and so fast and easy. Make your rice at the same time! Get all of your ingredients together and measured out. This will make the process go smoother. Also have the rice in the pan and ready to go. Turn on the pot's Sauté setting. When it is hot, add the oil, and then the ground beef. Cook beef until it loses the pink color. I use 90% lean beef, so I don't drain, but drain the excess fat if there is more than a few teaspoons. Add garlic, soy sauce, water, brown sugar, sesame oil, ginger, Asian pear (if using), red pepper flakes, and white pepper. Mix well, scraping the bottom of the pot to get up any browned bits so you don't get the Burn error. Set the trivet in the pot over the beef. Put the rice, water, and butter in the pan and set on top of the trivet. Close the lid and set the steam release knob to the Sealing position. Press the Pressure Cook/Manual button or dial and the + or - button or dial to select 4 minutes. When the cook cycle is finished, let the pot sit undisturbed for 9 minutes (9 minute Natural Release). Then turn the steam release knob to the Venting position and release the remaining pressure/steam. When the pin in the lid drops down, open the lid and use silicone mitts, a pan gripper, or such to carefully remove the pan of rice. Then fluff the rice with a fork. Remove the trivet and stir the bulgogi. Serve the bulgogi over rice, on lettuce leaves, in taco shells/tortillas, garnish, and enjoy! We loved this! The flavor was so good. We had it as lettuce wraps. Next time I want to make it using ground turkey, is the cook time the same? Hi Karla! I’m so glad you liked it! I love using ground turkey, and the cook time stays the same unless you are using turkey breast. Then take 1 minute off of the cook time, as it’s a drier meat. Thank you for your review! didn’t even have to wash the pot, it was scraped so clean. Tonight, I’m going to try this with chicken breasts. I’ll up the cook time to 12 minutes & check if they’re done. Should I cook the rice separately? Will 12 minutes overcook it? Hi Charisma! I’m happy to hear the family loved this, but sad that you only got one serving! I think your rice and chicken can cook together, just like I show with the ground beef. As long as the chicken is cut into slightly larger than bite-sized pieces, and only brown it lightly first, it will cook in the same amount of time. You won’t need to up the time. The time is for Jasmine rice, but may work with regular white rice as well (that’s how I cook it). I’m getting ready to make this…what do you mean rinsed rice. We just rinse it off with water and dump it in? Yes, just rinse it until the water is no longer white, and runs mostly clear. How would I use this recipe with a instant pot mini 3qt instead o a 6qt? Hi Mike, you should be able to fit a full recipe in the 3 qt. If you choose to make the rice as well, you will want to use a 6″ sized pan. I’m planning to make this during the week (looks like something I can throw in the pot, turn on, and then run to get the kids after work) but I see a sauce in the picture that looks awesome. Do you have a recipe for that too or did I miss it? Thanks! Hi Nicole! I used some soy sauce, ginger, a little sesame oil, and a pressed garlic clove. Sometimes I add a touch of brown sugar. Can I use Stevia sweetener instead of brown sugar? Yes. I don’t have experience in how to use it, but you can sweeten it however you like. Made for dinner tonight. Directions clear and easy to follow. I cut the sugar down a bit and cut the garlic up in bigger chunks for a bite! My rice came out a bit gluey, not sure if I measured well enough or got it out at the right time. Haven’t had great success in the rice department yet. Overall, very delicious. Thank you for sharing!! Hi Cate, I’m glad you liked this recipe. You may want to try rinsing your rice until the water runs clear before cooking it. That has worked for me. Thank you for your review! Do you mean a frying pan? Yes it can. I can’t wait to try this!!! 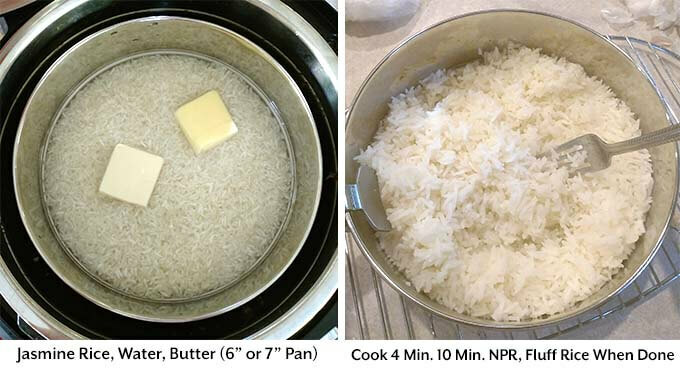 I am new to Instant Pot, so my question is, can you use any smaller pot (like a rice cooker insert) to cook the rice? My Instant Pot only came with one pan/insert. Thanks! Hi Lara, yes as long as it is an oven safe dish or pan, it should work. I have a 7″ cake pan that I use. Works great. The thing that would help you is a tall legged trivet to get the pan of rice up off of the meat. I listed one under the recipe card in the post (Amazon link). Hope that helps! Wow thank you for such an easy, delicious recipe! My bf and I loved this! I ended up making brown rice, in a rice cooker, but will try with jasmine rice in the Instant Pot next time. Made “Kimchi-Style Sautéed Cabbage” from Bon Appetit to go with it. Excited to try more of your IP recipes. I already have cooked rice. Would the time be the same without it in the pot? Yes, it’s the same cook time. Hi Sandy, I live in an area where there is a large Korean population, and I often cook with gochujang. I’d like to know how to adapt this recipe to include it. I’m thinking maybe I’d leave out the brown sugar and cut down on the soy sauce. What do you think? And another question. Can I really put the rack over the contents and a dish with rice on it? The rack seems very small. Is that just for the 6 qt model? Hi Janet, I would just add 1 or 2 Tbsp of the gochujang into the recipe and cook it that way. It will be a stronger flavor, and spicier. The trivet I use has tall legs, but you can just set the trivet on the meat, though the bottom of the pan will get messy. Here is the tall legged trivet I use (My affiliate link). Very cheap and so useful! This is a great recipe! I did add 2 tablespoons of gochujang with the other ingredients so it was a little spicy but so flavorful! I only used about 1/4 tsp red pepper flakes. My tall trivet hasn’t come yet so I just used the trivet that came with the pot with a small round Pyrex bowl and the rice cup measurement of rice with equal water (I thought 1 1/2 cups of rice might be too much for the pot). The meat mixture came up the sides of the glass bowl a little but it didn’t seem to matter. I used basmati rice that I had rinsed. Perfectly cooked. Delicious! ? That’s great, Pam! I’m very happy you liked this recipe. Thank you for your review! Looks delicious! I wanna try it but was wondering go if I could make it from frozen ground beef? Just throw everything together? If the beef is raw, and in a one pound block, it will need 20 minutes to cook on a trivet. Then discard some of the grease and make the recipe. You can try adding all of the ingredients, but I’m afraid will end up too greasy. Maybe if you use very lean ground beef? Hi… I have a larger group that I want to make just the beef for. If I double the recipe do I need to increase the cook time at all? Also, I don’t normally stock low sodium soy sauce. Is it okay to use regular? Hi Joy, no, don’t increase the cook time. I think regular soy sauce is fine. Thank you for your response. I used the regular soy sauce and ended up tripling the recipe. It came out awesome! I will definitely be making this again. That’s great, Joy! I’m so glad you liked it! Thank you for letting me know! I used a 7″ round stainless cake pan. Use something oven safe. This is Delicious!! I made this with stir fry beef and added some mirin as well. I just purchased an Instant Pot, and was a bit intimidated to cook in it. Your directions were very thorough and easy to follow Thank you for this recipe! That’s great! Thank you for letting me know! Excellent! We are currently living in an efficiency while we wait for a new home to be constructed. The kitchen is literally 3′ x 3′ with 2 burners, a microwave, a toaster, and a small sink. I bought a 3qt IP. Earlier this week, I made your spaghetti in it – excellent! Tonight this. The only difference – I don’t have an insert pan for rice, so I used microwave rice. I cooked the full meat recipe and pressure cooked it for 3 minutes to let the flavors infuse. Hi Sandy! How exciting that you will get a new home! I’m glad this recipe worked for you in your cute little kitchen space! Thanks for leaving a review! This was delicious! Both of my kids had seconds. And what a quick and easy meal! That’s such a great substitution! We also eat ground turkey! Thank you for your nice review! My family loves this! My boyfriend was skeptical at first because I always find wacky instapot recipes that turn out bad but this one won him over. He even requests it! I use ground turkey because of dietary restrictions and white rice because that’s what we prefer and it works perfectly every time! Even my super picky 3 year old loves it, he has declared his favorite food to be ‘meat’. Thank you so much! That’s awesome, Lena! Thank you for letting me know. When you can feed everyone in the family with one recipe, it really is nice! My family ate every morsel and told me to be sure and keep this recipe. I am still marveling that I could cook the rice and the beef at the same time and have it all come out perfectly. It’s amazing. I had a good deal of juice at the bottom of the pot and so I cooled it and added some cornstarch, put it back in the pot to thicken, returned the mee and heated everything in the “gravy”, and had a perfectly delectable moistened meat that I surrounded my beef with. Looked very fancy because the rice was cooked in a round bottom stainless pan that is usually a mixing bowl (I don’t have lots of accessories –yet) so I just flipped it over into a perfect dome of rice and surrounded the rice with the meat Wish I had thought to take a photo for you. Thanks so much! Hi Gayle! That sounds wonderful! Thank you for letting me know. I am so glad you and your family liked this recipe! I have a bottle of bulgogi sauce I bought a while ago and since lost the recipe I was going to use it for. Been wondering what to do with it until I spotted the title of your recipe. I usually prefer to make the sauces from scratch but would like to use up this bottle. Which ingredients would it replace in your recipe? Hi Leanne, not being familiar with this bottled sauce, I couldn’t say with any certainty which ingredients it will replace. I’m guessing it is meant to use alone, over the meat. Hi, this looks great, but I have a mini, and I don’t like to have a lot of leftovers sitting around. How would I go about cutting this recipe down to about 2 servings, cook time and all? All the info on converting recipes from the large pot sizes to the mini are so confusing. Hi CK, just cut the recipe in half, but keep the cook time the same. This was really good.. I didn’t do the rice portion since I already had cooked rice made. Thanks for a yummy recipe! That’s great, Sheila! Thank you for your review! This is absolutely amazing!!!! Like top notch greatness. We loved this, thanks so much for the recipe. I used a little less sugar and it was still plenty sweetened! That’s great, Laura! Thank you for your review!